After months of fierce opposition from local leaders, the New York Times reports that Amazon has decided to pull out of its plans to place a new satellite headquarters in the Long Island City neighbourhood of Queens, New York. While some polls showed New Yorkers generally in favour of the project – which was projected to bring 25,000 jobs in exchange for economic incentives many saw as exorbitant – legislators put up fierce resistance to deal, which they criticised for being carried out in secret. 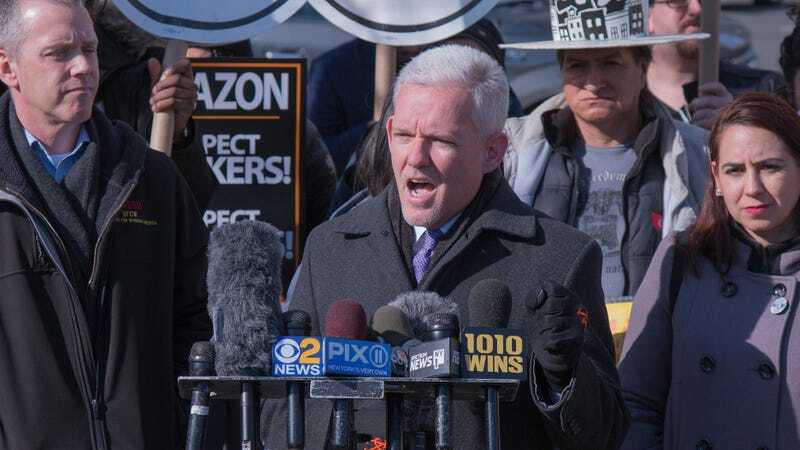 A major inflection point occurred at a New York City Council hearing late last month, where Amazon representatives affirmed the company’s opposition to the unionisation of its workers. Even Governor Andrew Cuomo, an outspoken proponent of the HQ2 deal, criticised Amazon’s stance as inconsistent. “New York State is a union town, and they should know that,” the governor wrote in a statement. Local politicians like Council Member Jimmy van Bramer and state Senator Mike Gianaris have been at the forefront of the resistance to the deal, which also included a grassroots coalition of local advocates including Make the Road, the Tech Workers Coalition, the Democratic Socialists of America, the Retail Wholesale and Department Store Union, and the Teamsters. Gianaris was expected to take a seat on the Public Authorities Control Board, which would have had to approve the deal unanimously. Council Speaker Corey Johnson characterized Amazon’s decision as a positive outcome for NYC residents. Part of Amazon’s long, public search for a second headquarters resulted in not one but two locations being chosen: New York and Virginia. While there has been some local resistance to the other HQ2, approval for $750 million in subsidies for the sister project nearer to the nation’s capital passed the state House of Representatives in under ten minutes. We are disappointed to have reached this conclusion – we love New York, its incomparable dynamism, people, and culture – and particularly the community of Long Island City, where we have gotten to know so many optimistic, forward-leaning community leaders, small business owners, and residents. There are currently over 5,000 Amazon employees in Brooklyn, Manhattan, and Staten Island, and we plan to continue growing these teams. The people of New York and America are increasingly concerned about the power of large multinational corporations and the billions in corporate welfare they receive. Our job is to end the race to the bottom where taxpayers in one city or state are forced to bid against each other for desperately needed jobs. This is what the rigged economy is all about. I congratulate New Yorkers for standing up to the power of Amazon. Amid the flurry of news that Amazon would both pull out of the New York headquarters and not seek to reopen a search for a replacement base of operations, the company also announced it would be capping its expansion in its home city of Seattle.